Duwan and Greg with a giant tumbleweed. 67.8 – In decibels, the loudest purr by a cat named Merlin. In comparison, a vacuum cleaner is about 70 decibels and conversation at a restaurant is 60. 395,605 – miles traveled by a toy mascot, a bear named Raymondo. Raymondo has traveled through 6 continents and 35 countries. 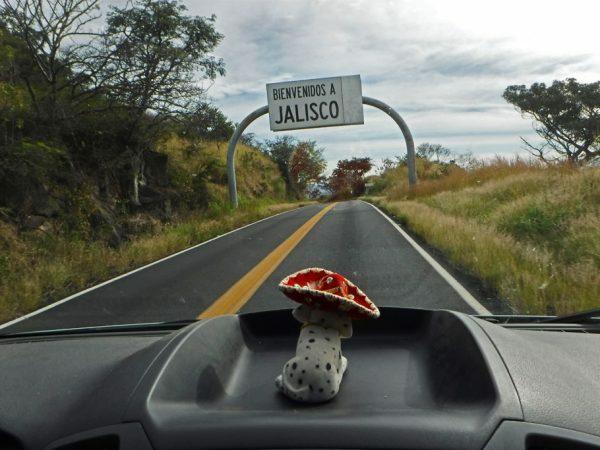 Bob (Our bobble-headed sombrero-wearing mascot), who has only been to two countries, is really, really jealous, and now thinks we are super lame. 24,250 – The weight in pounds of the largest space telescope, the Hubble Space Telescope. But before we get to OUR numbers here is a little wrap up in words. December was all about Mexico! We worked our way down the western mainland coast then cut over into the mountains. 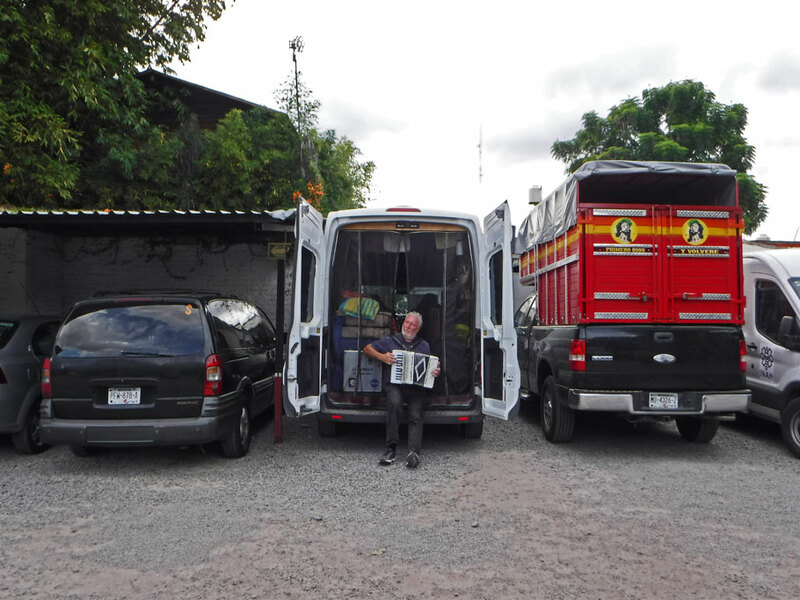 We stopped in Guadalajara for a while due to our broken computer, then headed south to meet some friends in Pátzcuaro, Michoacán on our way to Mexico City where we finished up the month. It has been quite an experience so far. We have seen lots of great stuff and have learned a few lessons. Enough of that. Lets start ticking off those numbers! 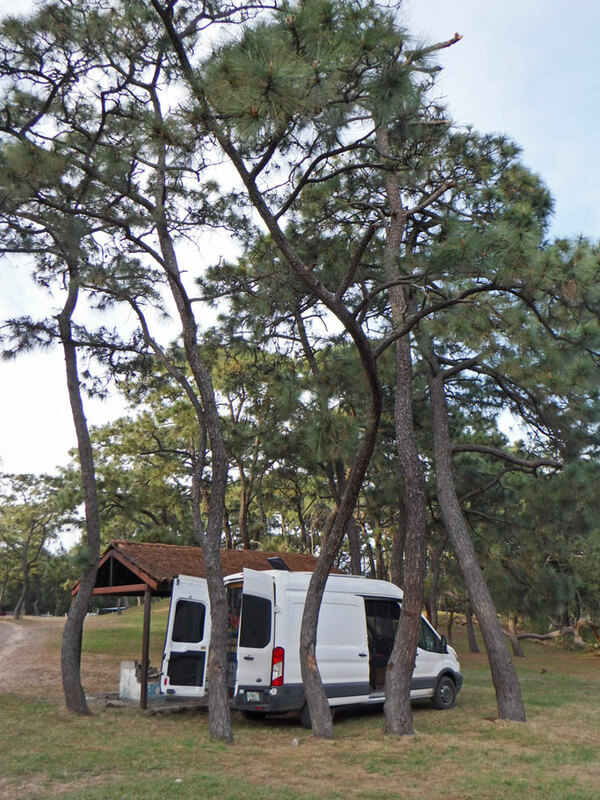 A nice camping spot at Parque La Primavera outside of Guadalajara. There was some activity when we arrived in the afternoon – families out for the day, playing games and sharing food, musicians strolling through the park, sweet-hearts relaxing under the trees – but as night fell everyone cleared out and we had the place to ourselves. Parking garage in Morelia, Michoacán. My favorite place to camp has become gated urban parking garages. We have stayed at two and they were both cheap to super cheap. Both had bathrooms and one had WiFi. The guys that run them are the nicest and love having Overlanders stay. Besides being a safe place to stay near a city center no one seems to mind much when Greg plays his accordion. 7 – Mexican states visited. Sonora, Sinaloa, Nayarit, Jalisco, Michoacán, México, and Cuidad de México! 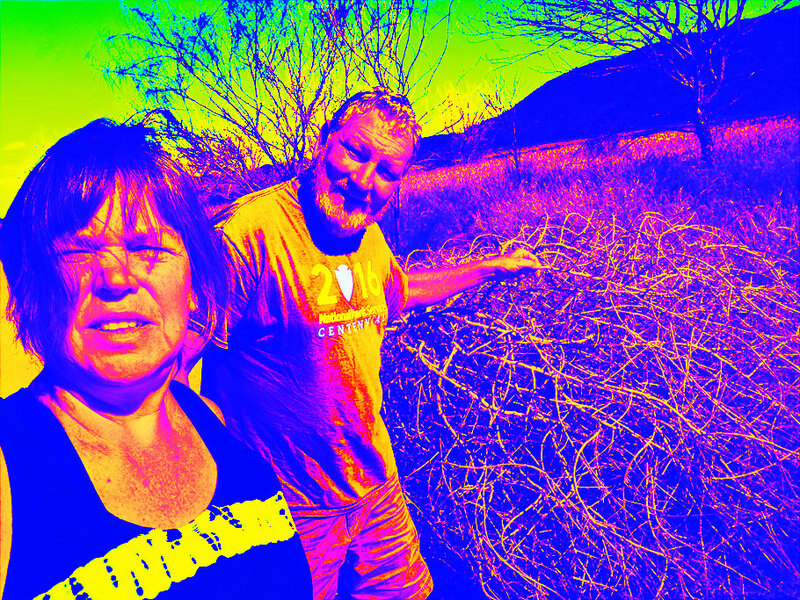 4 – How many times Americans spoke to us in English in Pátzcuaro. I think people see us and figure it is pretty safe to assume we speak English. Most of these people were Mexican-Americans (from as far away as Connecticut!) who were visiting their family and sharing their history and their ancestry with their children. Hanging out with Wayne in Mexico City. 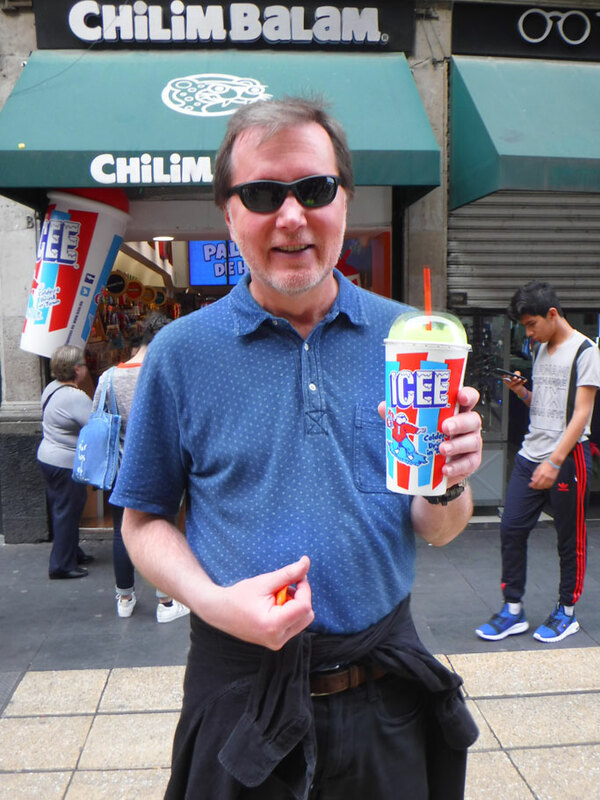 He was very pleased to find an Icee. 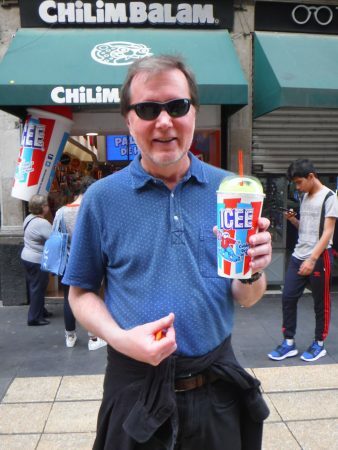 Unfortunately, even though he looked in many 7-11s he never found a Big Gulp. 3 – Friends from Atlanta we’ve met up with in Mexico. We spent several days with sailing friends and Mexico residents Jules and Jeff in Patzcuaro (post to come) and shared an Airbnb in Mexico City (another post to look forward to) with our friend Wayne who flew in from Atlanta for vacation. Grapes for New Years Eve. We had a few tequila shots too. 12 – How many grapes I ate on New Years Eve. 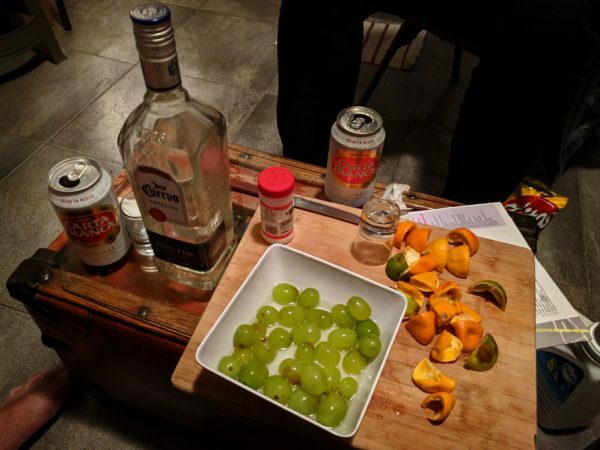 It is a Mexican tradition to eat one grape for each chime of the clock at midnight on NYE. We did it a little differently – starting at 11:48 we ate one grape every minute until midnight sharing a reflection about the past year and sometimes a hope for the future. There are an abundance of all these things no the road in Mexico. Potholes weren’t a big surprise since we saw plenty of those when we were in Baja last year. And we certainly knew there would be topes, but I was a bit surprised at the frequency and the places that we come across them. They can be found just about anywhere – on steep cobblestone streets I wouldn’t have guessed that anyone could speed on to major highways. 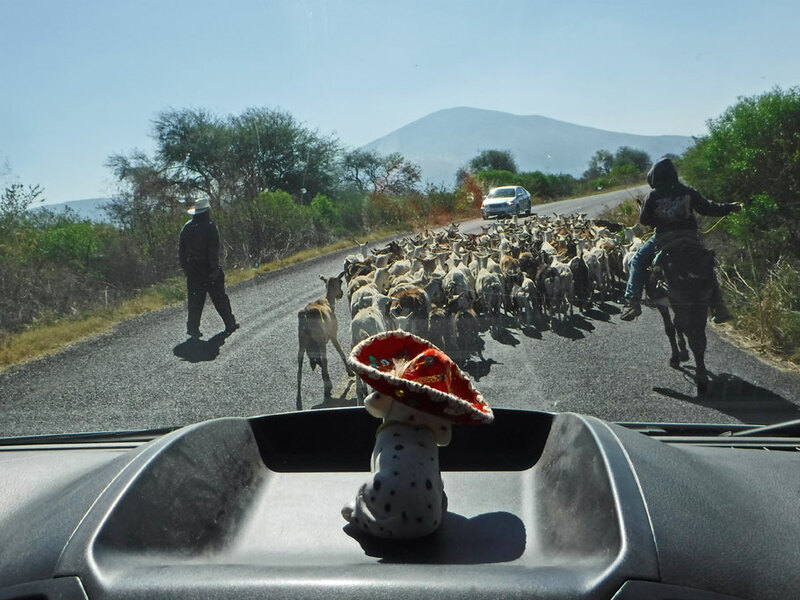 We have been a bit surprised by the amount of dogs (there are dogs everywhere – luckily all the dogs we have seen have been super chill and have seen few that looked like they were unhappy), the tractors, and livestock we find on the road. But really there are lots of things that slow us down – like a street designated for two way traffic with parking on one side that is barely wide enough for us to travel down without hitting the parked cars with our passenger side mirror, a lake-side town with flooded streets, a million trucks on the two lane free roads (as opposed to the many 4 lane toll roads zigzagging across Mexico) who are too cheap, like us, to pay the tolls, a giant tumbleweed – it’s a running list. If we had followed Google Maps had ignored this sign we would have been in big trouble but we stopped and took notice of the handwritten part added to it directing us to the left for El Himalaya. Look for street signs and street direction signs (for one or two way streets) attached to the corner of buildings. Doesn’t matter if it’s your home or office building, if you are on the corner the name of the street will be attached to your structure (that is if there is a street sign at all). If we see a hand written directional sign, follow it no matter what Google Maps says. Don’t get me wrong – I love Google Maps but I’m not sure GM understands Mexico nearly as well as Mexicans do. ¡Arriba, arriba! ¡Ándale, ándale! Hombre Verde, you only have 9 seconds left. Crosswalk signals are different here in Mexico. Instead of a little white guy ambling across the street the signals show an animated green guy running across the street. As your time runs out to get across the animated running guy goes faster. As amusing as it is, it is really quite accurate as how you should approach crossing a busy intersection – very quickly. The don’t walk signal is usually just a red guy standing still – but sometimes you run across a little red guy impatiently tapping his foot. Generally when greeting people on the street instead of just saying “hola” (hello) people say “buenos días” (good morning) or “buenos trade” (good afternoon). Not only does this seem a little more formal but it also means that you need to keep track of time. Greet someone with “buenos días” at 12:01 and you will get at “buenas taaaaaardeeees” in return. Poinsettias. Poinsettias just grow in peoples yards, at campgrounds, at ruins sites, in cracks on the streets, anywhere here in Mexico. And I just thought they were potted plants bought only at Christmas which promptly lose their red leaves and are unceremoniously thrown away. * Click pics to enlarge and open into a slideshow. What numbers have been significant in your life lately? Do you know any fun fact numbers? 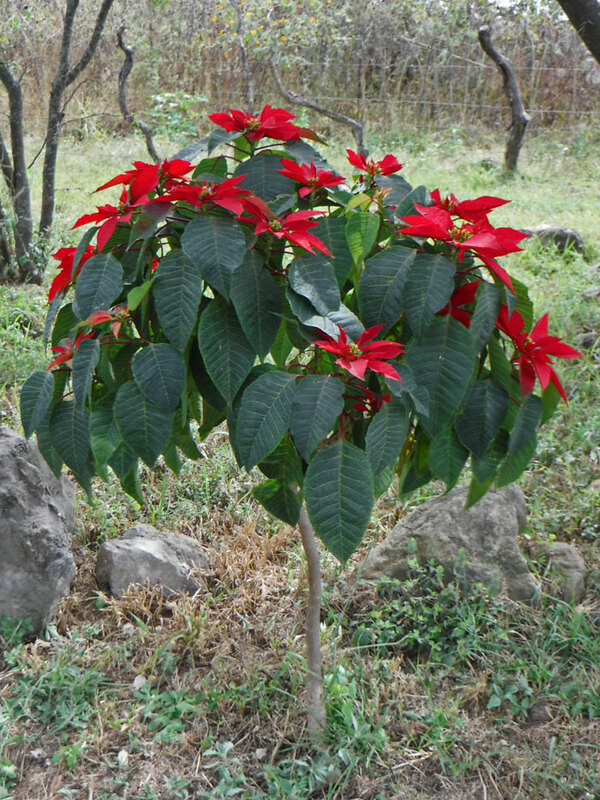 Poinsetas growing at the ruins site of Teutchitlán. 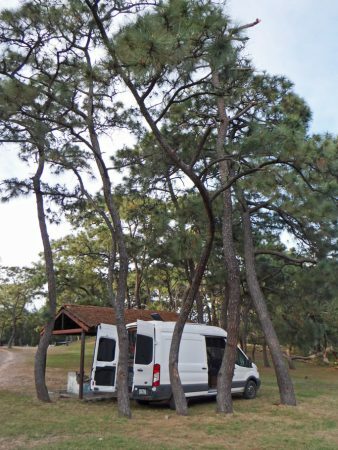 This entry was posted in Nomading, Nomading Numbers and tagged boondocking, Camping, Goats, Mexico, Nomad, Overlanding, Traveling. Bookmark the permalink. I love how you have random numerical facts in addition to recapping your month in numbers. 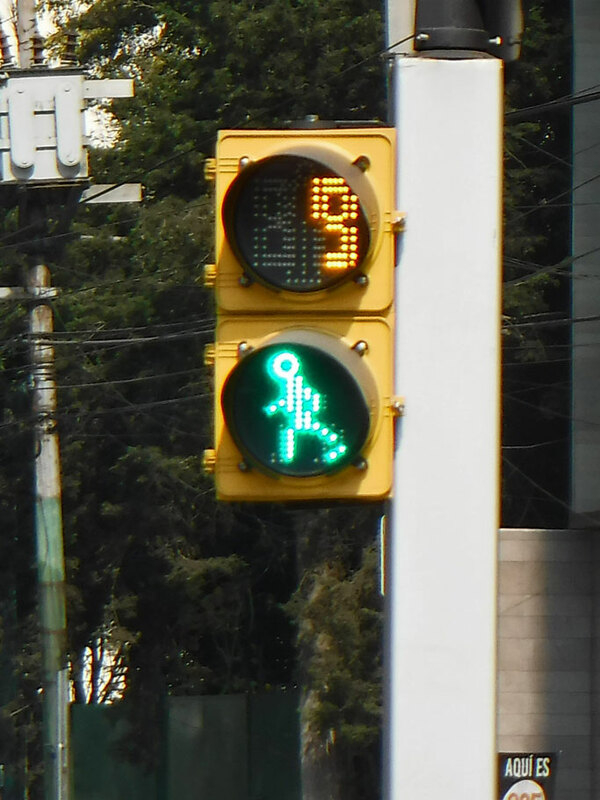 I think we should have Mexican crossing signals in the States. They sound like a lot of fun, especially the red man tapping his foot. It was kind of hard getting the pic of the green running guy because whenever he popped up I really needed to run. Mexicans seem to have a great sense of humor. Glad you like the random number facts. Keep reading and you will know lots of useless info about cats, traveling, and science! Your welcome Brenda! 2018 is looking good so far! I’m glad you had some quiet nights in Mexico as well. And, paying at a Walmart parking lot? How does that work? Enjoy the rest of your Mexico adventures. Especially your time with friends over NYE sounded amazing! So some grocery stores and Walmart have pay parking lots. You get a ticket when you go in and pay when you leave. Yesterday we went into one of these type parking lots and couldn’t figure out how to get out! We thought we would pay as we left and put our ticket in the machine on exit but found nowhere to put the money. It was quite confusing. As I am standing there trying to figure it out a voice comes out if a speaker at the ticket “kiosk”. I have no idea what the guy is saying but he is trying to help. We back out of the exit line (luckily no one behind us) and go back and park. A guy comes up to us (the one speaking to me through the speaker, I assume) and leads to a kiosk where you pay on the outside of the grocery store. “Oh! Gracias!” we say. We feed our ticket into the machine, pay, and then have 9 minutes to leave. We have hit a tope hard too. Everything in the back went flying. No real damage, but we have since screwed a few things down. I can’t believe your truck camper moved. 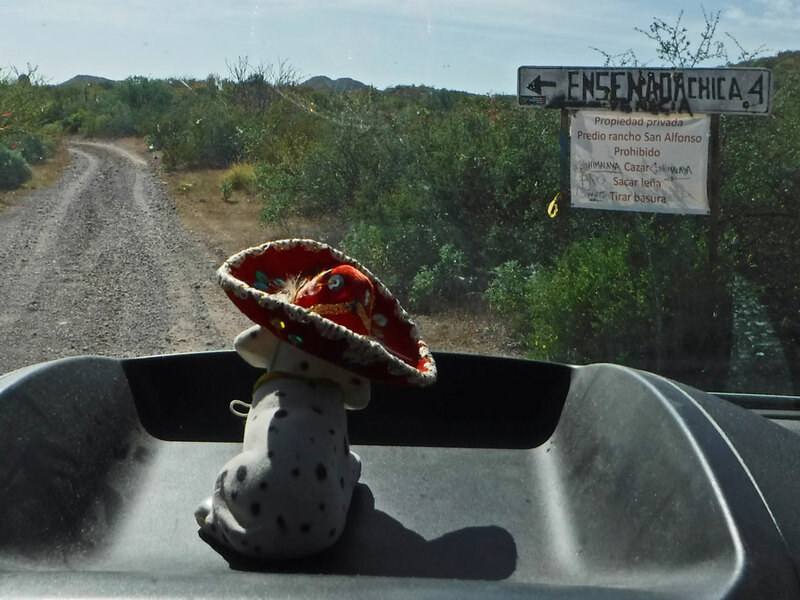 Sometimes we see Mexican trucks going down the road loaded up so precariously I think one wrong move and everything will fall off – not sure how they do it – especially going over the topes! Great way to put your trip into perspective, plus more fun facts. Did Wayne try some of the more local refreshments, as well? Lots of beer and some tequila was tried! Wayne passed up his chance to try crickets the first day and then later when he decided to try them we couldn’t find them again. We also tried Dorilocos – but now I’m giving away next months numbers post!